Welcome to The Ozone Company - The only ISO 9001:2008 certified ozone manufacturer in the industry! A Measurement & Verification Report on The Ozone Company reveals that our savings analysis completed during a site evaluation is 98% accurate. Contact us today to have an analysis done for your organization. We are currently interviewing dealers across the country and abroad to help distribute our Ecowash products. Become part of a winning team, contact us today. The Ozone Company is looking to connect with Energy Service Companies (ESCOs) to further expand it's product reach. Contact Andrew Rupnow today with any B2B inquiries. 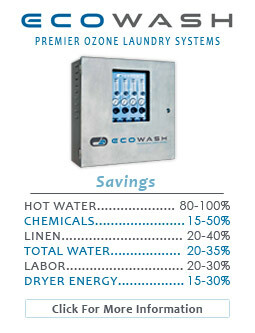 Learn more about our Ecowash premier ozone laundry product line - download a brochure from our Resources section for product details.